We help some of the world’s leading brands navigate China’s complex technical and digital innovation ecosystem. The ThoughtWorks Access-China Programme is designed for Western brands that want to reach Chinese consumers or tap into China's advanced innovation ecosystem. The rise of China in the global economy can’t be disputed. In many categories, Chinese consumers are already the largest spenders, and Western brands are starting to shift their strategies to capture their interest and custom. Alongside the development of these strategies, organisations are now looking towards the Chinese innovation ecosystem, which has driven the success of some of the most powerful brands in China. Leveraging the learnings of this progressive market has enabled the disruption of even the most traditional industries and organisations around the world. 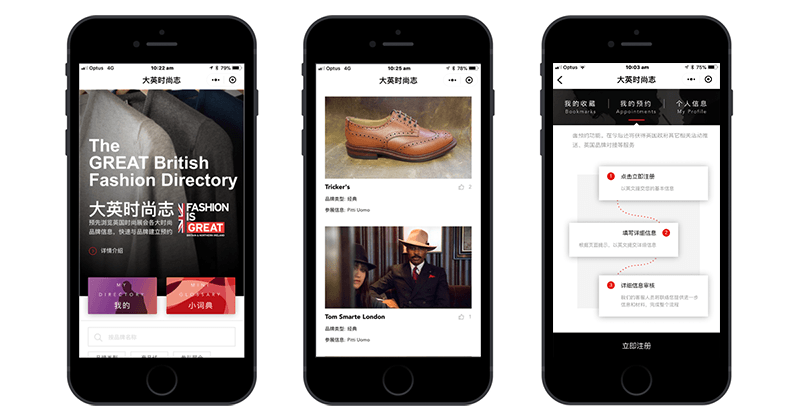 As total fashion sales in China are expected to treble by 2020 to the tune of £290 billion, DIT partnered with ThoughtWorks to design and deliver The GREAT British Fashion Directory platform, a WeChat mini program that helps Chinese retail buyers connect with British fashion brands. Starting to explore opportunities in China? Whether you want to connect with Chinese consumers, or leverage China's innovation ecosystem, we’ve designed two engagement options to help you wherever you are on your journey. Connect with Chinese consumers, at home, or abroad. Our Agile approach allows you to constantly introduce new features that will continue to excite your audience. For brands just starting to explore opportunities in China, we offer a 10 week discovery program, helping you identify the most promising opportunities to connect with the Chinese market. Using software, we then turn these ideas into a Minimum Viable Product, so your business can assess the potential prior to making a large investment. 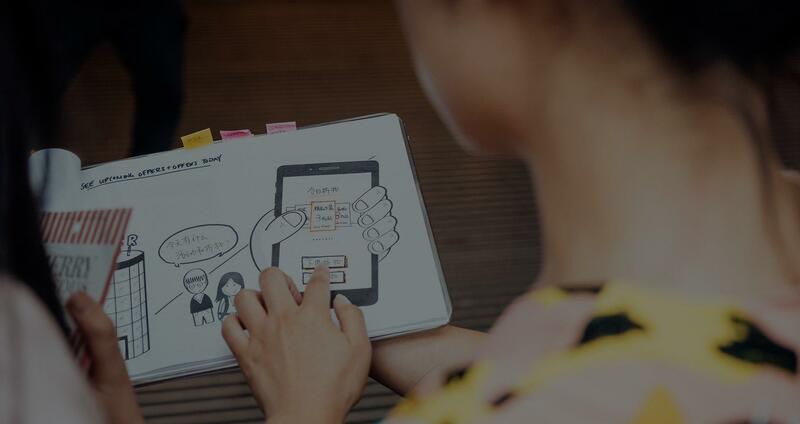 For brands already connected to China, we run bespoke workshops to find gaps and opportunities in your current product and technology strategy. Our cross functional development teams enhance your platform and bring new ideas to life in weeks, not years. Leverage China's advanced tech ecosystem and access emerging technologies, such as IoT, Robotics, Augmented Reality and Data Science through our technology expert teams in China. Regardless of where you are on your journey, we recommend you witness China's innovation ecosystem with your own eyes. We organise China Innovation Tours and expose you to China's most exciting companies and modern cities, including Shenzhen, the world capital of hardware. For businesses that have a revolutionary idea and need emerging technologies in order to bring it to life, we offer global delivery collaboration that gives companies a unique competitive advantage. We helped Myer, a leading Australian department store, attract Chinese tourists with a 10 week ‘Discover China’ pilot. This innovative award-winning platform that was built on top of WeChat, provided Myer and its brands with a gateway into the lives of Chinese consumers, who have dramatically increased spending in stores since the launch. REA Group is the largest property portal in the world, helping millions of people to buy, sell, or lease properties every year. Nigel Dalton, REA's Chief Inventor, has described the partnership with ThoughtWorks and China: "Our partnership with ThoughtWorks and China gave us access to a group of cross cultural, multilingual creative engineers. Major ideas that started in hack days have made it into successful new products in market." As Britain’s economic relations with China take on increasing importance, so too does CBBC’s role in helping British companies in China. A new business-led initiative aimed at increasing Greater Manchester’s commercial connectivity with China. China’s innovation ecosystem is growing at the speed of light. We would love to be a part of your journey and help you Access China, fast. Thank you for contacting us. A member of the Access China Program will be in touch within 48 hours.